If you're heading to Morocco for vacation or business, know that you're in for a gastronomical treat. The food of Morocco ranks high on lists of the world's best cuisines and is well worth exploring. You won't be disappointed with the incredible variety, exotic seasoning and innovative ingredient combinations that await you. Not heading to the Maghreb anytime soon? Then pick up a Moroccan cookbook or two and indulge in the flavors of Morocco in the comfort of your own home. The following slides feature ten famous Moroccan foods to seek out in restaurants and in Moroccan homes. Couscous is prepared weekly in many Moroccan homes and the presentation pictured here, couscous with seven vegetables, is one of the most popular versions. Lamb, beef or chicken is stewed along with a variety of vegetables then arranged on a glorious heap of tender, steamed couscous grains. As with many other Moroccan dishes, everyone gathers round to eat from one super-sized communal plate. Not into veggies? Then you may want to try couscous tfaya with caramelized onions and raisins. Chicken bastilla is Morocco's famous rendition of a savory pie, and it simply doesn't get better than this. Traditionally pigeons were the birds of choice, but here chicken is cooked with saffron, ginger, pepper and cinnamon, then layered within crispy warqa pastry with an herb-laden omelet and and fried almonds scented with orange flower water. An utterly amazing fusion of flavors and textures. If sweet and savory is not your thing, then be sure to seek out a spicy Moroccan seafood bastilla. The sky's the limit when it comes to tagine, the famous slow-cooked Moroccan stew which takes its name from the traditional clay or ceramic dish it's traditionally cooked in. 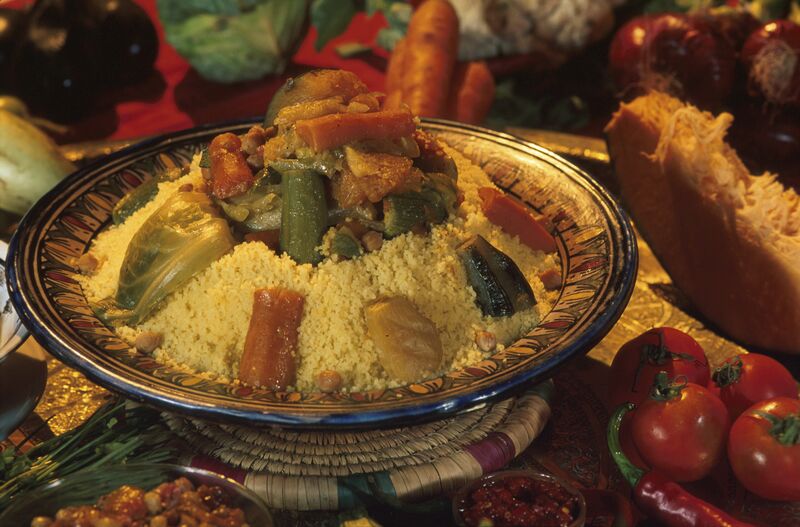 Shown here is a Berber tagine with meat and vegetables. It's arranged in conical fashion and left undisturbed to cook until tender, making a delicious, beautiful presentation. Tagines are traditionally eaten directly from the cooking vessel, using pieces of Moroccan bread (khobz) to scoop up meat, veggies and sauce. This classic, versatile dish is also one of Morocco's most famous and ubiquitous. And no wonder! It's utterly delicious and works beautifully for any occasion ranging from casual family dinners to celebratory banquets. You'll find it offered in homes, restaurants and even on the street in tiny outdoor dining venues. Shown here is a Roasted chicken with preserved lemons and olives presentation, but the dish is also easily prepared in a traditional tagine or conventional pot. Lots of onions are cooked to a puree-like consistency with saffron and ginger; preserved lemons and olives are tangy additions to finish the dish. Even if you don't normally reach for prunes when grocery shopping, don't be put off by this particular combination of sweet and savory. Your palate will be well rewarded for venturing into new Moroccan territory with this Lamb or beef with prunes recipe. The meat is cooked until buttery tender with saffron, ginger and onions, then topped with prunes which have been poached in syrup with cinnamon and honey. Crunchy fried almonds serve as a garnish. Still not convinced? Then maybe you'd rather try another classic Moroccan dried fruit tagine, chicken with apricots. Moroccans like to heartily season their ground beef or lamb (kefta) with cumin, paprika and herbs. In its simplest form the spiced kefta is shaped and then grilled or pan fried, but you'll also find kefta used extensively in other dishes, such as this popular Meatball tagine with poached eggs. Despite the ample tomato sauce, no pasta is required, but you will want some Moroccan bread to use in lieu of a fork. Moroccan kefta recipes will give you other ideas of how Moroccans have creatively transformed ground meat from boring to fabulous. There may be nothing elegant about pouring hot meat and broth over a plateful of bread, yet around the world such humble fare is regarded as savory, satisfying comfort food at its best. In Morocco it takes the form of Rfissa, a spectacular presentation of stewed chicken and lentils fragrantly seasoned with fenugreek, saffron and Ras el Hanout. The dish is famously served to new mothers, but it's also a popular specialty dish to offer to family or guests on other occasions. You'll find all kinds of soups served in Moroccan homes and restaurants, but this one stands out from the crowd for being uniquely Moroccan and very much loved throughout the country. Variations are countless, but typically harira is a tomato-based soup laden with lentils and chickpeas. Rice or fine broken noodles (chaariya) are often added as well, while the stock is usually made with beef or lamb. This authentic Harira recipe does not fall into the quick and easy category, but the effort put into making it won't disappoint. Moroccan roasted lamb, referred to as mechoui, is perhaps best sampled in Marrakesh, where whole lamb is roasted in deep pits with smoldering araar wood. But worry not; you need not dig a hole in your backyard if you want to try roasted lamb at home. Instead, try this Moroccan mechoui recipe which calls only for a leg or shoulder. The waters along Morocco's extensive coastline provide an abundant supply of sardines, making this tasty, very healthy fish an affordable indulgence. You can keep things ultra simple and simply bake or grill whole sardines, but one of the most popular ways to prepare them is to stuff sardine fillets with a zesty marinade called chermoula and then fry them. It's a treat not to miss, whether as a sandwich filler or as an entree set out alongside other fish and seafood for a Moroccan fried fish dinner.